Chanukah Book Haul & December OwlCrate Review! Chanukah wrapped up for the year on January 1, and I have to say, my family was mighty generous this year! We don’t typically buy a lot of gifts during Chanukah, but hubby knew that 2016 was a pretty crappy year for me, and went out of his way to get some of my most highly desired gifts! Of course, the Tesla that he ordered arrived this month, so maybe they were guilt gifts, BWAHAHAHAHAHA!! Off topic – we LOVE the Tesla!! We have been planning this purchase, and saving up for a few years now, and it is everything we expected and more! And super-easy on road trips, as we just got back from a North Carolina to Florida trip! By far, my favorite gift this year are the two customized Funko Pops! that hubby bought for M and I. Made by Mason Bartlett, from his Etsy shop FocoCustom, these were such an amazing and thoughtful gift, that look just like us! The one on the left is M, complete with blue hair (which has faded out since the fall), her favorite Paris t-shirt, her Gizmo watch, and the kitty ears headband she wears all the time! I love that my Pop! has the sunglasses that always hang out on the top of my head, a scarf that I often wear, and even my Fitbit! M bought me the Bernie Sanders Funko Pop!, and he has already had a rousing debate with the Hillary Pop! M received for her birthday. If we can’t make it to NYC to see the musical anytime soon, then this is the next best thing! Yay for receiving a gift off of my TTT Chanukah Wish list post! So much fun in one picture! From M, a bunch of Forest Fellows Iwako erasers, and the school supplies eraser set. I collect these, and her picks are a great addition to my collection! Can you find the gray koala hanging out in the background? The coveted clothbound Game of Thrones set, another gift on my TTT wish list post! HappyHelloCo bookmarks, off of another one of my bookworm gift lists! I also received a Sur La Table gift card from my parents, which will be used to replace our dying toaster oven! I am very thankful for the generosity of my family this year. The December OwlCrate theme was EPIC!, and I wasn’t sure what to expect other than at least one HP item. Our Mensch on the Bench was very excited to see what was inside. (Mr. Mensch snuck into our house this year unbeknownst to me…ahem…thanks hubby and M). I’m still not a fan of the whole Elf on Shelf/Mensch on the Bench thing, but he is kinda cute. I have to say, this is probably my least favorite of the three Owlcrate boxes that I have received so far, but it still had some great things in it to make the purchase worth it! 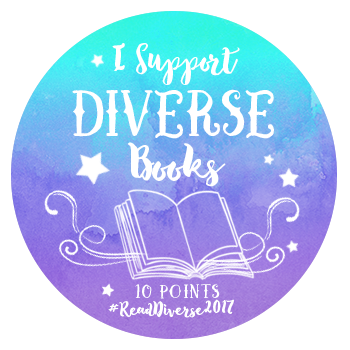 Despite the mixed reviews I have seen, I am quite excited about this month’s book selection, Of Fire and Stars by Audrey Coulthurst, especially since it was already on my TBR list for #DiversityBingo2017! Lord of the Rings pin, designed by Jane Mount (Ideal Bookshelf). Game of Thrones coasters, a perfect accompaniment to my GoT book set! Designed by Dark Horse Comics. Sticker quote inspired by The Darker Shade of Magic, designed by Miss Phi. I love this one! Chronicles of Narnia greeting card by Susanne Draws. I’m not a Chronicles of Narnia fan, so I feel a bit meh on this one. However, the design is quite lovely! OwlCrate is a monthly YA box subscription. You can find out more by visiting OwlCrate. The January Box theme is “Classic Remix”.